A strong performance by the whisky industry helped push Scottish food and drink exports to an all-time high last year. According to official figures, £5.4bn worth of food and drink products were exported in 2011, surpassing industry targets six years ahead of schedule. 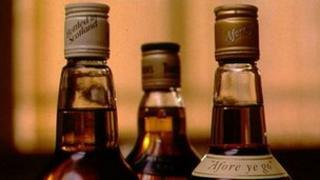 Whisky exports broke new records, increasing in value by 23% to £4.23bn. Scotland's top food and drink export markets were France and the US, with strong growth in Singapore and China. The full-year figures for food and drink exports were published by HM Revenue and Customs. They are said to "exceed all expectations", with the industry having already met its 10-year target to increase exports to £5.1bn by 2017. The US remained the biggest single market by value for whisky exports, with a 31% increase to £655m. France remained the biggest market measured by volume - up by more than 25% to £535m. Food exports increased 9% year-on-year, to a record £1.16bn, with fish and shellfish accounting for 56%. The fastest growth in the food sector was seen in fruit and vegetables, which increased by 62.4% to £62m. Rural Affairs Secretary Richard Lochhead said: "Scotland is rightly hailed as a land of food and drink, which is underpinned by the record exports achieved in 2011. "This demonstrates that people around the world are appreciating the high quality and delicious products that Scotland's larder has to offer. "With exports increasing by more than a fifth, the whisky industry has seen hugely impressive year-on-year growth, while Scotland's iconic seafood remains at the heart of our food exports offering. It's also heartening to see a substantial 60% boost in fruit and vegetable exports." James Withers, chief executive of Scotland Food and Drink, said: "Our food and drink industry is Scotland's biggest growth story right now. "These new figures mean that the 10 year target industry set itself in 2007 - to grow our total exports by 38% - has been achieved six years early. "Whisky has been a trailblazer across the globe. But our food sector is now following its lead, with exports up a staggering 62% in just four years, as our reputation as a land of food and drink grows day-by-day." For whisky exports some markets saw decline, including Spain and South Korea, but there was growth of more than 40% to Brazil, Taiwan and Singapore, which serves as a distribution point for much of east Asia. Gavin Hewitt, chief executive of the Scotch Whisky Association, said: "Despite continuing economic uncertainty, Scotch whisky continues to meet increasing demand from all corners of the globe. "It continues to appeal to consumers in countries such as the USA and France and is being enjoyed by younger professionals in newer markets in Asia and Latin America. "Exports have increased for seven years running contributing to delivering an export-led recovery, a focus for both the UK and Scottish governments."